The mission of the Disability Services Office is to support your full access to the learning environment here at Bank Street. We can work with you to determine which accommodations may best meet your learning needs, assist you in advocating for yourself, refer you to additional resources, and provide information about your rights. We also support faculty and staff in their work to create equitable and accessible learning environments. The Disability Services Office at Bank Street College provides reasonable accommodations to Bank Street graduate students with disabilities. 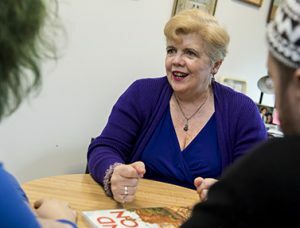 If you have a diagnosed disability or suspect that you may have a disability, contact Peggy McNamara, Coordinator of the Disability Services Office, at dso@bankstreet.edu or 212-875-4586. The Disability Services Office is located in Room 607 at 610 West 112th Street. In addition, you will be involved in ongoing consultation with the Coordinator of Disability Services throughout your time at the College. The College provides reasonable accommodations that maintain the content focus, skills development, goals, and general integrity of each course, field experience, and related assignments. For example, although the College may be required to provide extended time to submit assignments, it is not required to change the substantive content of the assignments. In addition, the College does not have to make modifications that would fundamentally alter the nature of a service, program, or activity that would result in undue financial or administrative burdens. The College may be required to remove any barriers impeding the student—architectural or communication- or transportation-related—or to provide reasonable modifications to rules, policies, or practices. The College may provide aids or services such as interpreters, note-takers, adaptive equipment, relocation of classes to accessible environments, audio recordings, computer programs, allowance of service animals, alteration of materials, or substitution of certain courses in programs. The College is not required to meet personal needs such as glasses, hearing aids, etc. Tutoring may be considered a personal need and is available to all students, contingent on the resources and schedule availability of the program. Set up a meeting with Peggy McNamara, Coordinator of the Disability Services Office, at dso@bankstreet.edu or 212-875-4586. This meeting does not obligate you to register with the office; it simply enables you to learn more or ask questions. If the Coordinator of the Disability Services Office determines that you may be eligible to register, you will need to bring in documentation of your disability and the way it affects your learning. This documentation will be kept confidential. Please see further details about the nature of this documentation in the FAQ tab. The Coordinator of the Disability Services Office will review your documentation. If a determination of eligibility is made, you will meet to talk about what kinds of reasonable accommodations and/or services will best support your learning. Please see the accommodations tab for more information. You will receive a letter outlining the accommodations you are entitled to; you can then choose to share this with faculty. The Coordinator of the Disability Services Office remains a resource to you during your entire time at Bank Street. Certain accommodations are mandated, such as the provision of alternate testing and evaluation methods for measuring student mastery. Modifications, substitutions, or waivers of a course, major, or degree requirement may be necessary to meet the needs of some students. It is discriminatory to restrict the range of career options for students with disabilities as compared to non-disabled students with similar interests and abilities, unless such advice is based on strict licensing or certification requirements that may constitute an obstacle. The law protects anyone who has a “physical or mental impairment that substantially limits one or more major life activities.” This covers physical, sensory and health-related disabilities, psychological disorders or attention disorders, and some learning disabilities–anything that might prevent the student from participating fully in the life of the campus community. Any change or adjustment in a work or school site, program, or job that makes it possible for an otherwise qualified employee or student with a disability to perform the duties or tasks required. When a requested accommodation causes undue hardship to an institution, said accommodation may be deemed to be unreasonable. Factors considered in determining undue hardship include the overall financial resources of the organization, the nature and cost of the accommodation, and the impact of providing the accommodation on the particular site or operation of the institution. As you begin to understand the factors that affect your learning in Graduate School, it is important to advocate for yourself. When working with your instructors and advisor, you are encouraged to be proactive, take some risks, and assume responsibility by identifying the approaches that support your learning needs. Is my disability status kept confidential? At Bank Street, it is entirely up to the student to inform instructors of her or his needs. Neither instructors nor advisors will be automatically notified by the Disability Services Office about a student’s disability. However, the Registrar’s Office is required by federal law to keep a list of students who are registered with Disability Services Office. May the College deny my admission because I have a disability? No. If you meet the requirements for admission, the College may not deny your admission because you have a disability. No. However, if you request accommodations, you must identify yourself as having a disability. Your disclosure of a disability is always voluntary. The College requires you to provide documentation of your disability and the ways it may impact your learning. This documentation must be prepared by an appropriate professional such as a medical doctor, psychologist, or other qualified diagnostician. The required documentation may include one or more of the following: a diagnosis of your current disability, the date of the diagnosis, how the diagnosis was reached, the credentials of the professional, how your disability affects a major life activity, and how the disability affects your academic performance. The documentation should provide enough information for you and the Coordinator of Disability Services to determine what is an appropriate academic accommodation. When should I inform the College I have a disability? Requesting an accommodation as early as possible is the best way to ensure your successful transition into Graduate School. No. You can only request accommodations at the beginning of your studies at Bank Street or at the beginning of a course. If a disability arises for which you request accommodations after your admission into the College or after a course is already in session, you must notify the Coordinator of Disability Services Office as soon as the disability is diagnosed. However, you cannot expect accommodations for a disability disclosed to the office after you have received a grade for a course or after you have handed in an assignment within a course. When accommodations are granted, they begin on or after the date of approval.